This is a screengrab from an online scrabble game I'm involved in. (I've delayed this post in order to avoid leaking information to my opponent). Regarding the ongoing scrabulous/scrabble debate - I understand Hasbro's point, but tend to think that more people will get exposure to their game (and hence sales) with scrabulous than without. I know that I would simply avoid the game otherwise, end even if every player online doesn't result in a sale, the more players there are, the more sales ultimately result. I can understand why they got all legalistic, but can't help thinking that they'd have been better off trying to bring scrabulous into the fold with its established user base. Flammable and Inflammable. That's surely asking for problems? Why do 'Fat Chance' and 'Slim Chance' mean approximately the same thing, when a 'Big Chance' and 'Small Chance' do not? This website lists recursively strange Islands and Lakes. To be honest, I began to lose track as I was nearing the bottom of the list! ... why doesn't Australia count as a big Island? Presumably, if it's a continent it can't be an island! If you've not done so already, it's worth signing up to YouGov. They are a survey company who periodically send notifications of surveys. They pay you for each one you complete. It typically takes a few minutes per survey, and you only get an email every few days or so. These surveys are quoted on the news and in papers etc. They're also fed back to companies, essentially anyone who commissions a survey. I've just done a 'brandindex' survey, it took about 2 minutes. Last night we went to see 'Evita' at the Adelphi in London. 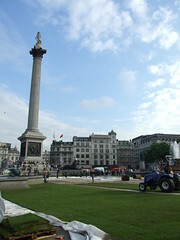 I walked in via Trafalgar Square, and found that it had been turfed over. Unfortunately, as I arrived they were taking the turf up, and so I didn't see the full effect. It did look good, though. Around Hayward's Gallery, look up. 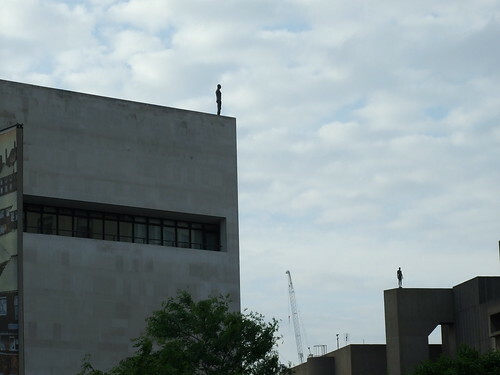 There are statues on the rooftops, people just standing there. I'm sure that permission must have been asked from the police (phone calls from people who only spot the one thinking it's a suicide attempt). The installation is part of an Anthony 'fog in the box' Gormley collection. She replied with the names of a few songs, saying they recorded 'Handbags and Gladrags' and 'Maybe tomorrow'. Not only does this provide a reasonable marker of my age (I remember the colour version), but it also reinforces that the word 'slightly' in the second paragraph was an understatement. One fisherman remembers plucking a piglet out of the bay, but nobody could recall a deer ever being landed. How Taxes Work . . . This is a VERY simple way to understand the tax laws. Read on — it does make you think!! The first four men — the poorest — would pay nothing; the fifth would pay £1, the sixth would pay £3, the seventh £7, the eighth £12, the ninth £18, and the tenth man — the richest — would pay £59. "Since you are all such good customers," he said, "I'm going to reduce the cost of your daily meal by £20." So now dinner for the ten only cost £80.00. The group still wanted to pay their bill the way we pay our taxes. So the first four men were unaffected. They would still eat for free. But what about the other six — the paying customers? How could they divvy up the £20 windfall so that everyone would get his "fair share?" The six men realized that £20 divided by six is £3.33. But if they subtracted that from everybody's share, then the fifth man and the sixth man would end up being PAID to eat their meal. So the restaurant owner suggested that it would be fair to reduce each man's bill by roughly the same amount, and he proceeded to work out the amounts each should pay. And so the fifth man paid nothing, the sixth pitched in £2, the seventh paid £5, the eighth paid £9, the ninth paid £12, leaving the tenth man with a bill of £52 instead of his earlier £59. Each of the six was better off than before. And the first four continued to eat for free. But once outside the restaurant, the men began to compare their savings. "I only got a pound out of the £20," declared the sixth man who pointed to the tenth. "But he got £7!" "Yeah, that's right," exclaimed the fifth man, "I only saved a pound, too . . . It's unfair that he got seven times more than me!". "That's true!" shouted the seventh man, "why should he get £7 back when I got only £2? The wealthy get all the breaks!" The nine men surrounded the tenth and beat him up. The next night he didn't show up for dinner, so the nine sat down and ate without him. But when it came time to pay the bill, they discovered, a little late what was very important. They were FIFTY-TWO POUNDS short of paying the bill! Imagine that! This video is of some French soldiers test firing their new anti-tank weapon. Watching the video, I expected the guy to fall over backward (or similar), I wasn't expecting what happened! I've just hit the 50 quid mark with YouGov, so I can expect a cheque to arrive soon - just about the right time of the year. If you haven't heard of YouGov, they do surveys for, well, whoever pays them, and they pay you each time you complete a survey (typically 50p, though it can be more). If you sign up to YouGov, you can quit at any point, no obligations and all that. The 50 quid should be with me in January, that'll be nice.